Kassandra Otley (center) and other protesters gathered last night at Trade and Tryon streets to show solidarity with the #NoDAPL movement. 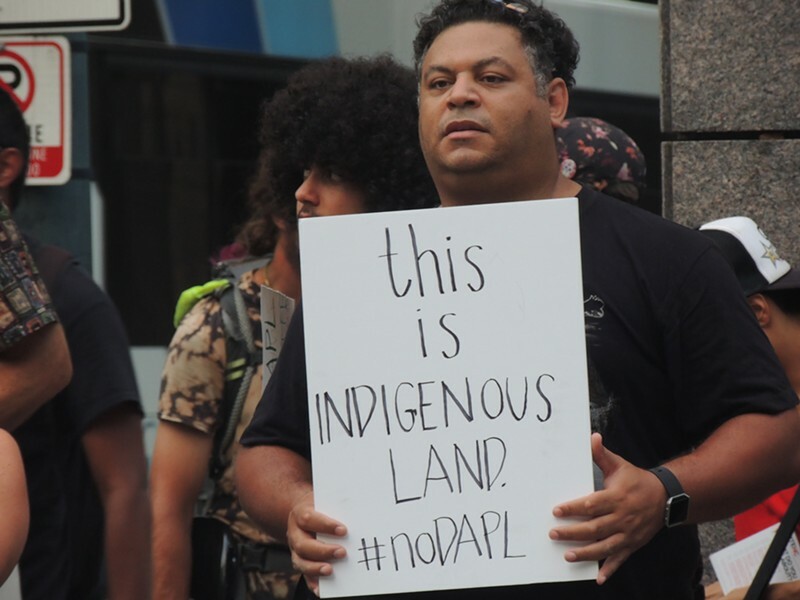 About 40 people gathered at the intersection of Trade and Tryon streets last night at the height of rush hour to show solidarity with the #NoDAPL movement, which has been gaining steam in North Dakota in recent weeks. Zach Easterling addresses protesters at the #NoDAPL solidarity rally. The protesters gathered in Charlotte shortly after a judge in Washington D.C. ordered a partial stop to construction of the Dakota Access Pipeline, while allowing it to continue in other parts of North Dakota that the Standing Rock Sioux tribe considers sacred. Six organizers from North Carolina — including one from Charlotte — will be heading to North Dakota on Friday to join the DAPL resistance. The DAPL is a $3.8-billion pipeline that, if finished, will stretch 1,100 miles from the Bakken shale fields of North Dakota to Peoria, Illinois. #NoDAPL protesters are working not only to protect sacred Sioux sites but also to stop the fracking that will follow the construction and prevent the negative effects on the main water source for the Standing Rock Sioux and about 8 million people living downstream. Resistance from members of the Standing Rock Sioux and other nearby tribes began early on in the construction process, but has grown in numbers and momentum in the last week or so as protesters from around the country have converged on North Dakota. Things came to a head on Saturday when protesters and security guards clashed following the alleged destruction of sacred Sioux sites by Dakota Access bulldozers. 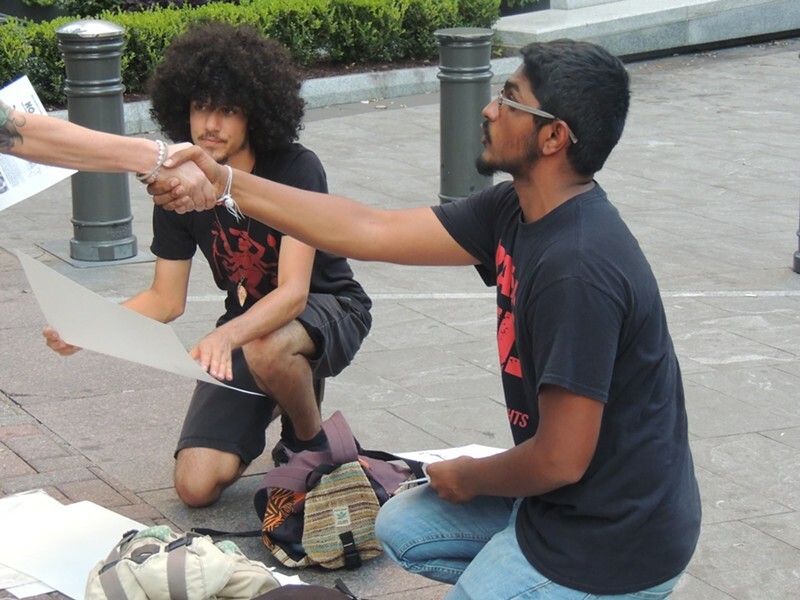 Druv Pathak handed out fliers to passersby and discussed the effects of the Dakota Access Pipeline. At last night’s rally in Charlotte, organized by local chapters of the Trans and Queer People of Color Collective (TQPoCC) and Show Up for Racial Justice (SURJ), protesters did not shut down the intersection as has been done in previous actions, but waved signs at passing cars while working to educate passersby on foot, some of which eventually joined in. Andrea Tommy of Rock Hill, who said she is an unrecognized member of the Cherokee tribe, made the trip to Charlotte to join the protest because she said otherwise she would be at home “hitting my head up against the wall.” She said she’s not the type to join the loud chants of her fellow protesters, but wanted to come show her appreciation for their efforts. Terry Creech of the Coharie tribe also came to address the group of protesters and stand in solidarity with them. Terry Creech of the Coharie tribe. Creech said he’s appreciative of organizations that usually focus on the movement for black lives standing up to fight for Native American rights, even when the struggle is centered in a conflict hundreds of miles away. On August 27, organizers with Black Lives Matter arrived at Red Warrior Camp, where North Dakota protesters are currently residing. 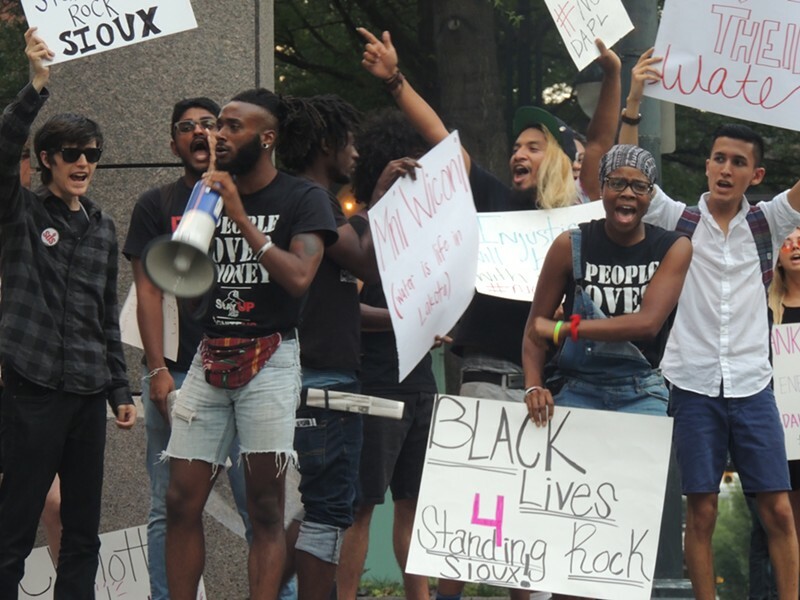 “Our liberation is only realized when all people are free; free to access clean water, free from institutional racism, free to live whole and healthy lives not subjected to state-sanctioned violence,” read a statement from the group. Gloria Merriweather (in overalls) and others protest the Dakota Access Pipeline in Charlotte on Tuesday. 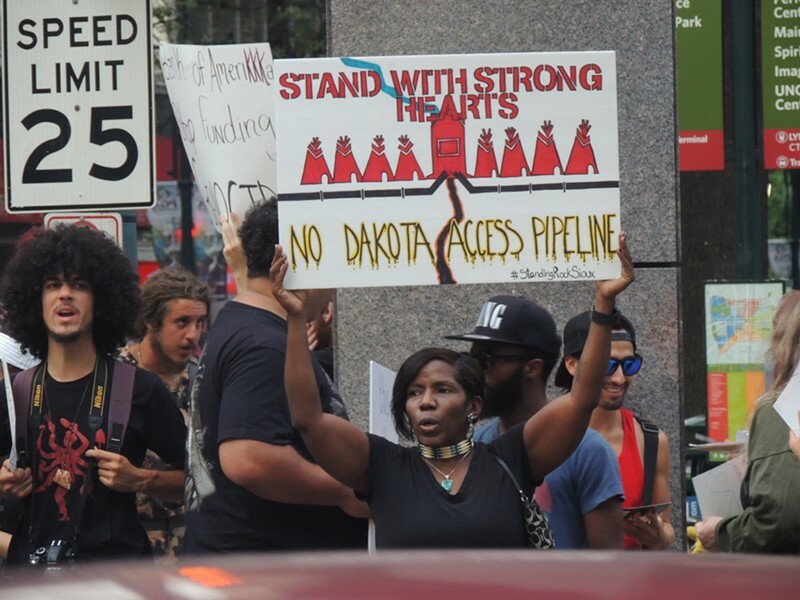 Gloria Merriweather, an organizer with TQPoCC Charlotte, said that people may not see the connection between groups like TQPoCC or Black Lives Matter and the struggle the Standing Rock Sioux are facing, but to her it’s obvious. Merriweather pointed out how folks in North Carolina are already facing water safety issues at the hands of corporations like Duke Energy. She also said local protesters will soon be organizing resistance against construction of the Atlantic Coast Pipeline, a natural gas pipeline scheduled to be built by Dominion. That pipeline will begin in Virginia and run through North Carolina. 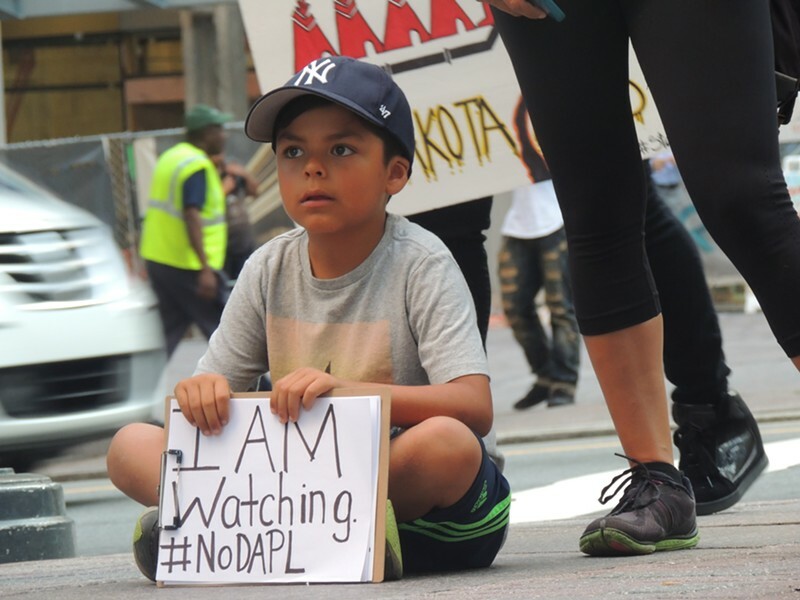 A 9-year-old boy at Tuesday's protest. On September 3, protesters were able to stop construction of the DAPL as it reached Highway 1806 through nonviolent direct action and mass assembly. According to leaders in the Red Warrior Camp, private security guards hired by Dakota Access LLC used dogs and pepper spray to push back the peaceful protesters; men, women and children who call themselves “water protectors.” According to a recent update, six water protectors were bitten by dogs while dozens were pepper sprayed. Dakota Access has said protesters “stampeded” the construction area, attacking guards and dogs with makeshift weapons. A video posted by Democracy Now shows a dog with the blood of protesters visible around its mouth. 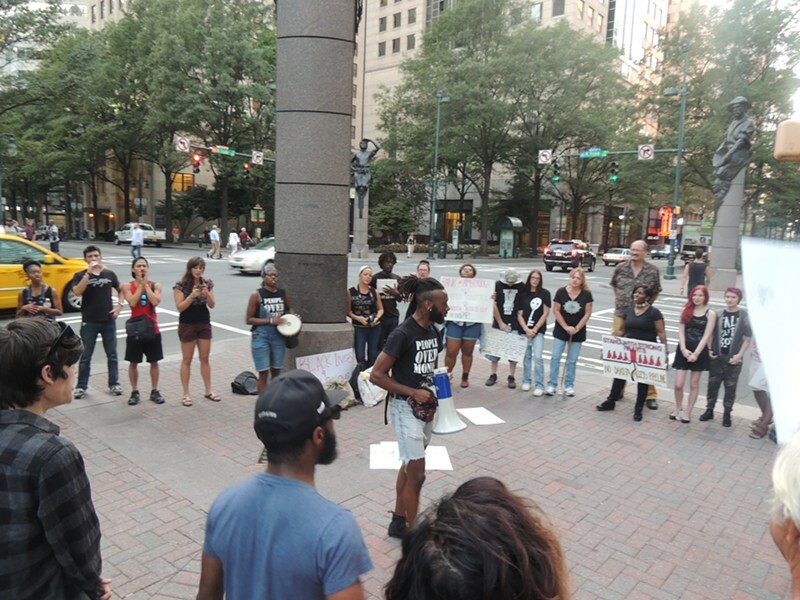 It was this behavior by corporate authorities that brought one woman, who only wanted to be identified as Kiki, to the rally in Uptown Charlotte on Tuesday night. The group of North Carolina organizers set to leave for North Dakota on Friday are currently raising money for supplies and travel costs. To donate, visit their YouCaring page.